Download Video Prtal Blogger Template, fully responsive- seo friendly, ads ready, video design suits for video blogs, free download video portal template for blogger. 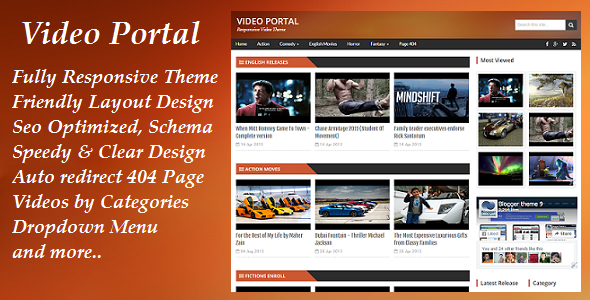 Video Portal Blogger Template has 2 columns with 1 Right sidebar and 4 columns footer. Color used in this template like White and multi colors. Video Portal blogger template is clean coded with Responsive design. Eye cashed social book mark ready with Template. You can touch with monetize of Ads ready template. Video blog and Share your comments option. Video Portal Blogger Template some more features of, Responsive site, Page navigation menu, Drop down menu, Auto Post thumbnails and much more. This template is very best choice for Video blog. This theme is recommended by me for video sharing blog purpose. This is one of the best Video blog template after BlogTube. So I would highly recommend it. One more thing, this theme is licensed under Creative Commons so please do not remove footer credits otherwise it will be redirect to BloggerTheme9.com. Leave your comments if you have any question.